Glitter Donuts are easy to make and a great way to dazzle guests at your wedding reception. Dazzle your guests with glitter donuts at your wedding dessert table. You can almost be certain your reception guests will have never seen donuts like this before. And yes, this glitter is edible. When only the finest will do for your wedding, or when its glitter and glam right down to the last detail, these donuts will ensure your guests get the point that your wedding is anything but ordinary. They look absolutely amazing, almost too good to eat – and yes, they look spendy. But truth be told, this is probably a lot more affordable than you think – if you can go the DIY route and you have a friend or relative who loves to bake and is willing to volunteer their efforts to making donuts the day before your wedding. Easier still, you can buy plain donuts in bulk from shopping warehouses like Costco or Sams Club – make sure to get them fresh, the day before your wedding. Then simply make your own glaze (see our recipe below), and sprinkle with edible glitter. Take it from the voice of experience though, its best to delegate this to a helper – you’ll have enough going on the day before your wedding, and you shouldn’t get your self tied down dipping donuts. 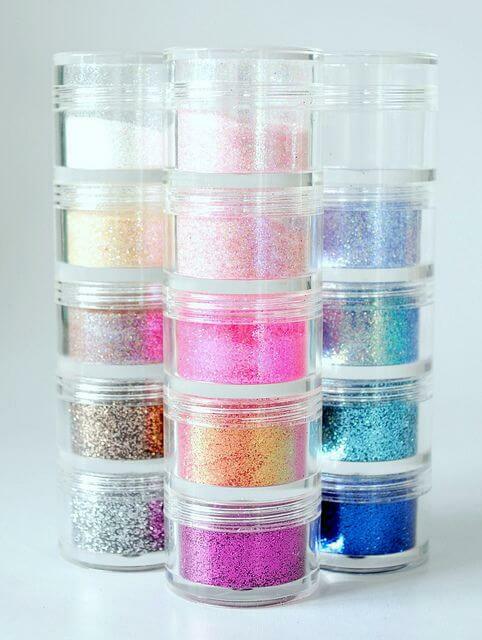 You can find edible glitter from baking supply stores. You’ll also find it at candy making suppliers and cake decorating suppliers. It needs to be sprinkled on when the donut glaze is still wet. It comes in an entire rainbow of colors, but we think the pink and gold combination shown here is absolutely magical. Apart from that iridescent, gold, or silver would be amazing. But BE SURE to ONLY use food grade EDIBLE glitter! Consuming any other type of glitter is toxic! Click here to see more of our glitter ideas! Of course, if you prefer not to DIY you can probably get any bakery to take a custom order and glitterize your donuts for you, but you can be sure there will be a hefty up-charge. So as always, we say, DIY all the way! Melt the butter in the microwave and add the powdered sugar, vanilla and milk. Stir until combined. Dip donuts in glaze or brush only over the top with a pastry brush. Then sprinkle with edible glitter. If what your wedding needs is a little sparkle, then check out these other glittering wedding details. Glittering Christmas Wedding Centerpieces – 4 Glittering Ideas You’ll Love! Small Pink and White Wedding Cake – See Five Ideas!